Galway on a Saturday morning is a buzzing place, and especially in the environs of St Nicholas’ where the myriad stalls of the famous Saturday market are found all around the churchyard. 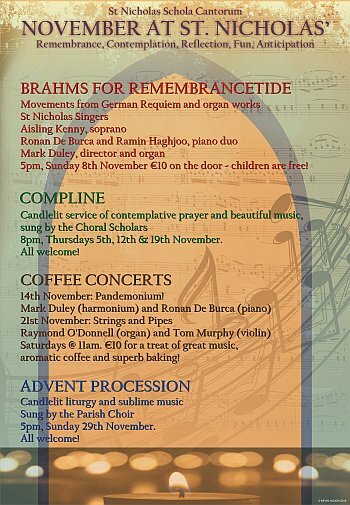 The Schola Cantorum Saturday morning coffee concerts at 11am offer the perfect haven amidst the hubbub: fine music performed superbly in the church’s very special ambience, and accompanied with excellent coffee and a sumptuous array of baking – all for €10! The Schola Cantorum team of bakers has become renowned for the quality of its produce, and care is taken too over the quality of the filter coffee on offer. The music on offer caters to every taste, and includes classical chamber music, choirs, Irish traditional and jazz groups, organ recitals, and much more.